Experience the outdoors this winter break! New York State Parksand Historic Sites offer a full selection of hikes, festivals and family fun that encourage all ages to participate and get active. Families with young ones can enjoy Thacher Park’s annual day of winter fun with outdoor scavenger hunts, relay races, and much more! Weather permitting; snowtubing will take place at Glimmerglass. Loved ones can celebrate Valentine’s Day with a lantern walk at De Veaux Woods or enjoy hiking/skiing on the half-mile candlelit trail at Selkirk Shores. In honor of Presidents' Day, Washington’s Headquarters will have music, military demonstrations, presentations and crafts for all to enjoy. Philipse Manor Hall will also have its collection open to the public with games and events throughout the day. For those seeking a more active approach during their winter break, take a hike to discover the ice volcanoes forming on the shoreline of Lake Erie at Evangola or join one of the many snowshoe hikes being offered at Minnewaska, Letchworth, Heckscher, Allegany, and Taconic-Copake Falls. Fisherman can test their skills at the Grafton Lakes 31st Annual Ice Fishing contest. For more events check our calendar. We’re now accepting reservations for State Parks’ newest campground, located along the majestic Hudson River at Schodack Island State Park. Forty-three of 67 sites offer 50-amp electrical hook-ups for trailers and recreational vehicles. New trail connections link the campground to the park’s existing 8-mile multi-use trail network. The campground will be open for an extended season from April 15 to Dec. 5, 2016. Reservations can be made up to nine months in advance at ReserveAmerica or by calling toll free 1-800-456-CAMP. 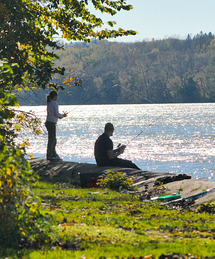 The 1,052-acre park boasts seven miles of Hudson River and Schodack Creek shoreline along with an improved bike trail, volleyball nets, horseshoe pit and a kayak/canoe launch site. Picnic tables and a large group picnic pavilion are available. Read more. 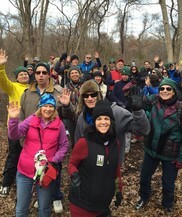 This year, New York’s First Day Hikes were bigger and better than ever! More than 2,860 people hiked a total of 6,897 miles at 39 state parks and historic sites on New Year’s Day. In its fifth year, the guided hikes program offered people (and some furry friends) on the trails a chance to connect with nature, history and each other. What a great way to kick off 2016 and inspire more time spent outdoors all year-round. A great big thank you to all the participants, Friends Groups, volunteers and staff who made the day fun! Photo gallery. Governor Cuomo recently announced an 800-acre conservation agreement to preserve a crucial gap in Taconic State Park in Columbia County, enlarging a major protected forest area in the Taconic Mountains. 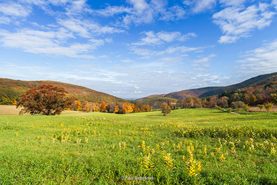 The easement protects High Valley Farm, which connects Taconic State Park and Massachusetts’ Mount Washington State Forest and Bash Bish Falls State Park, and ensures contiguous and undisturbed forestland. The deal ensures that the South Taconic Trail crossing the property remains available to the public, while the balance of the property stays available for farming. Dozens of houses could have been built along the property’s extensive road frontage, and the easement will prevent significant development or inappropriate forest management, while protecting scenic views. The interconnected forestland provides critical habitat for plants, birds, fish and wildlife, including wide-ranging animals like the black bear. The agreement brings to fruition a years-long collaboration between The Nature Conservancy, the Columbia Land Conservancy, New York State, and the property owner, Edgar Masters. Read More. 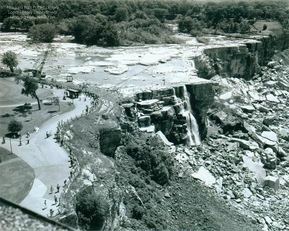 Photo: Dewatering Niagara Falls occurred in 1969 for a study of the Falls’ geology. Governor Cuomo's 2016-17 Executive Budget holds great news for State Parks, by continuing his bold plan to invest $900 million in State Parks by 2020. 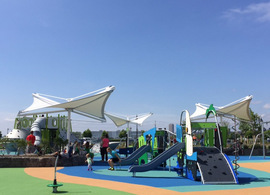 The Governor's NY Parks 2020 plan is funding capital improvement projects that are providing visitors with safe, fun and modern facilities at our state parks and historic sites. Photo gallery. Don’t let cabin fever consume you! There are plenty of outdoor activities to enjoy this season. Join Allegany State Park on Mondays in February for a sunset hike/snowshoe hike (weather dependent) at the Red House Area. Hikers will meet at the Sunset Lodge at 4:30pm, where they will venture into the new Bear Paw trail. This trail is designed to highlight snowshoe use and hiking with dogs (as long as they are properly leashed). Participants should bring a flashlight, water, snowshoes and dress accordingly. 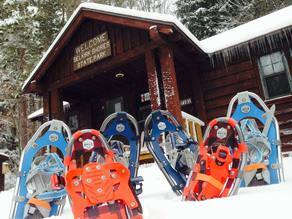 Check the park’s event page for details on snowshoe rentals. Brave the elements and test your disc golf skill with the Mine Kill State Park Disc Golf Course Ice Bowl. Pro, intermediate, amateur and recreational divisions will partake in two rounds of winter disc golf with prizes awarded to the top players in each division. The event is scheduled for Feb 27th at 9:00am. Call the park office (518-827-8690) to register and for more information. Discover a new trail or enjoy your favorite! 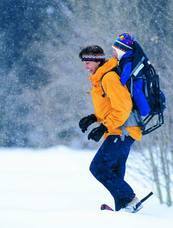 Snowshoeing and winter hiking are available at numerous parks throughout the season. There are countless opportunities to stay active and exercise - no matter your age or fitness level. Visit #GetFitNYS events. Twenty-eight years and it’s flown by. I started with the Planning Bureau in 1988 creating maps and databases for research and publications. 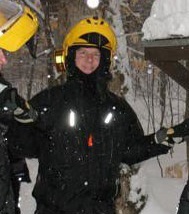 That took me across the state doing fieldwork until I moved to the Snowmobile Unit in 2006. Just about anything to do with snowmobiling! We award over $4 million in grants to fund 10,500 miles of snowmobile trails. I maintain a GIS database of the funded trails as they change every season. We work closely with law enforcement and track all snowmobile accident reports. We administer a safety program, and we've assisted in educational rides, trail inspections, training workshops, and special events. What’s the coolest thing you’ve ever seen? While riding on a brisk day with a recent heavy snowfall covering everything, I came over a small hill and saw a tree filled with about 10 wild turkeys watching me as I passed on the trail beneath them. It was an unexpected and unusual sight. What’s the coolest thing you’ve ever done on the job? That’s a tough one to choose. While on a late-night snowmobile trip in St. Lawrence County, I stopped for a break and leaned back to take in the crystal clear night. The crisp cold air, stillness, vibrant stars, and the realization that this experience came as part of my job was pretty cool! Is there a destination you’d recommend to someone? It’s hard to pick just one. Allegany State park has 75 miles of scenic trails to ride and winterized cabins to stay in, but it’s hard to beat riding remote trails in the Adirondacks. As I moved on I came to appreciate working with dedicated people inside and outside of government. Many have worked very hard to expand safe recreation for the public. Throughout the year, we are proud to feature volunteers who contribute countless hours and talents to making state parks and historic sites better places for everyone in their communities. New York State Parks has a long tradition of volunteerism which not only enhances our facilities but strengthens the connection people feel with their parks. There are many ways to volunteer at state parks and historic sites. If there is a project or program you’d like to make happen at your favorite park, stop in at the park office and speak directly with the park manager to learn more about volunteer opportunities. Joining a Friends Group is a great way to become more involved in the park community. Over 85 of our state parks and historic sites have friends groups. Contact information, meeting schedules and events are available on our website—attend a meeting or sign up to help out at an upcoming event to learn more about their activities. 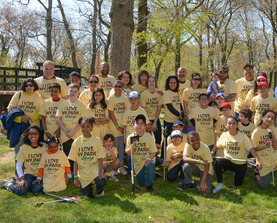 Mark your calendar and attend I Love My Park Day on Saturday, May 7, State Parks’ annual volunteer day with projects at over 100 state parks and historic sites. Thousands of people across the state come out to parks and historic sites on this day, now in its fifth year, and it is the perfect opportunity to give back and become involved.